On the morning of March 28, 2018, surrounded by her family, Helen Marie Pope was welcomed into the loving arms of her Father In Heaven. 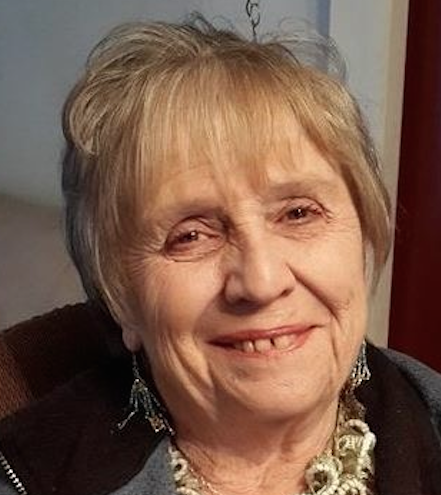 She passed away at South Lincoln Medical Center in Kemmerer, WY. She had lived at South Lincoln Nursing Center for the past few months. Helen was born on January 8, 1935 in Kemmerer, Wyoming, the daughter of Andrew Michael Churlick, Jr and Adele C. Carollo. She graduated from Kemmerer High School, and later married Robert Lee Pope at St. Patrick’s Catholic Church, on March 2, 1957 in Kemmerer, WY. Helen took great pride in being a great mother, grandmother, and great grandmother. Her family meant everything to her. She was a devout member of St. Patrick’s Catholic Church in Kemmerer, Wy. She loved to attend church, then go out to breakfast with her family afterwards. She enjoyed a good game of cards, as well as other games she enjoyed playing with her family and friends. In her younger years, she loved to go camping, and loved to spend time doing embroidery. She enjoyed taking Senior Citizen trips to Wendover to gamble. Helen loved animals and loved to have them surrounding her. She always wanted them to be with her in heaven. Helen enjoyed eating out at restaurants. She was always up for a drive up the country or traveling to places she enjoyed. A son, Robert Lynn (Laura) of Diamondville, WY; a son, Wilber Ben (Valerie) Pope, of Diamondville, WY; a daughter, Janet Delores (Jeff) Paulson, of Clairsville, OH; and a daughter, Janelle Adele Simpson, of Cowley, WY. Helen is also survived by her loving grandchildren, James Robert Pope, Sara Anne Pope, Jessica Sue Pope, Christopher Ben Pope, Amanda Kay Meacham, David Allen Paulson, Amber Marie Rasmussen, and Trever Sebastian Simpson. She is also survived by her great grandchildren, Braxton Lynn Pope, Dominic Lee Pope, Christian Robert Pope, Aspen Anne Pope,Trinity Gracelynn Pope, Michelle Anne Pope, Dorothy Helen Pope, Victoria Ivy Pope, Touren James Pope, Annastacia Marie Pope, Matthew Reid Meacham, Michael Jeffrey Meacham, Brady Alan Paulson, Brentley Jane Rasmussen, and Macey Marie Rasmussen. Helen was preceded in death by her parents, her husband, Robert, and one sister, Jeanette D Churlick. Rosary will be recited on Thursday, April 5, 2018 at 7:00 PM at St. Patrick’s Catholic Church. Friends may call for visitation at St. Patrick's Catholic Church on Thursday, April 5, 2018 from 6:00 P.M. until the time of the rosary. Mass of Christian Burial will be conducted on Friday, April 6, 2018 at 10:00 AM at St. Patrick’s Catholic Church. Interment will follow services at the South Lincoln Cemetery, Kemmerer, WY. Memorial contributions may be made to that of the donors choice. Online condolences may be left at ballfamilychapel.com. Ball Family Chapel of Kemmerer, WY has been entrusted to arrangements.